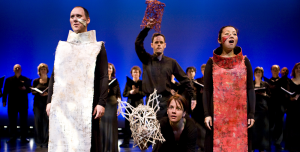 Help Soundstreams bring innovative new works to life! A new opera inspired by the events leading up to the kidnapping and assassination of Québec Vice Premier Pierre Laporte by the Front de Liberation du Québec (FLQ) during the October Crisis of 1970. Soon to enter its workshop phase, Laporte examines this watershed moment in Canadian history 50 years later. Music by André Ristic and libretto by Nicolas Billon. 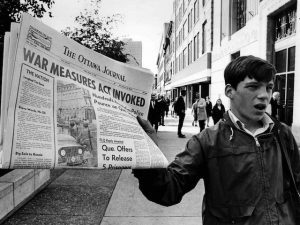 A newsboy holds up a newspaper with a banner headline reporting the invoking of the War Measures Act, in Ottawa, Oct. 16, 1970 the first time Canada had invoked the act in peacetime.